Lindenwood University offers you the opportunity to earn a bachelor of arts (BA) degree and teaching certificate in elementary education. The elementary education teaching certification qualifies you to teach grades 1-6 in the state of Missouri. It provides a curriculum focusing on teaching philosophies and methods in core courses required for young students to master in order to further their education. Accompanying the courses taken is a field experience, which gives you the opportunity to apply what you have learned in the Lindenwood University classroom to the elementary classroom. Working with children and experienced teachers, you get the hands-on experience necessary to become a highly qualified educator. 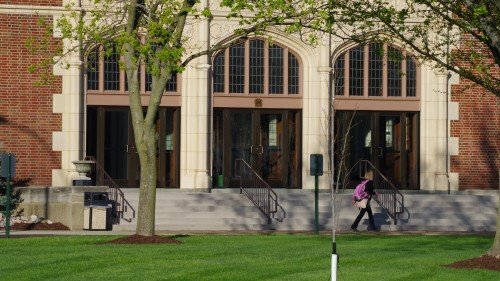 The unique cluster program at Lindenwood University allows you to take three classes in one semester while only coming to campus one night a week. While this program is intense, you can finish your degree faster and still keep your life. The highly credentialed and experienced education faculty at Lindenwood University brings both academic and real world professional achievement to the classroom. They collaborate with colleagues from many school and community partnerships to deliver outstanding innovative learning opportunities for you and all of our education students at every level of experience. Lindenwood University offers a bachelor of arts (BA) in education with elementary certification, which requires 65-67 credit hours in elementary education, 21 credit hours in content area, and 26-27 credit hours additional coursework. Topics of study include methods of integrating art, music, and movement in elementary education, elementary/middle school language arts, social studies, mathematics, science, and classroom management. You must pass all sections of the Missouri General Education Assessment to be admitted into the Department of Teacher Education. If you are pursuing your MAT, you should meet with your advisor to review your undergraduate transcript to determine which courses meet the Missouri certification requirements. What Can I Do With Elementary Certification from Lindenwood University? When you complete your degree in Elementary Education from Lindenwood University, you are a certified teacher ready to teach grades 1-6 in the classroom. The Occupational Outlook Handbook at the Bureau of Labor Statistics is an excellent resource for you as you plan your career, whether it be staying with the elementary certification or pursuing other certifications enabling you to teach other grade levels or subjects.